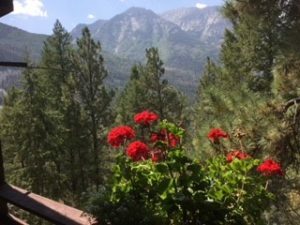 Located at 8000 feet above sea level, this peaceful refuge nestled in the picturesque Crystal River Valley of the Colorado Rockies has been set aside for rest, healing, and life transformation. Guests will feel the comfort of home with homemade meals, a cozy fireplace, and welcoming retreat staff. In addition, Marble Retreat is surrounded by world class recreational opportunities throughout the year including fly fishing, hiking, skiing, and wildlife viewing. A guest favorite is experiencing a mountain hot spring at Avalanche Ranch in nearby Redstone, at Iron Mountain or Spa of the Rockies in Glenwood Springs, or “roughing it” and going to the natural hot springs on the Crystal River just north of Redstone. The Marble area offers beauty, serenity and adventure. Our guests appreciate this, as they can incorporate rest and recreation with their Christian counseling experience. A guest who went into the backcountry on a day off from counseling said, “This was the greatest experience of my life.” If you’d rather just curl up in front of a fire with a good book, soak in the hot tub, or lie in the sun, it’s available right here at the Lodge. Marble Retreat enjoys the grandeur and peace that this high, sub-alpine region offers. Individuals with histories of severe medical illness, such as cardiovascular diseases, should note that Marble is approximately 40 miles from the nearest hospital. Although heart patients ordinarily tolerate elevations below 11,000 feet without difficulty, it is advisable to consult a physician prior to coming. Our lodge was built and furnished with comfort, care, and renewal in every cozy corner. It feels like the perfect place to receive nurture and that’s just what happens. Guests will feel the comfort of home with the homemade meals, cozy fireplaces, and welcoming retreat staff. Each of four guest bedrooms has a private bath and glass doors that open onto a spacious deck overlooking the spectacular Crystal River Valley. A stone chimney rises three stories. Fireplaces on two levels invite easy conversation in the warm living room and cozy group counseling room. Rich woodwork, antique furniture, and well stocked bookcases create a comfortable, homey atmosphere. A recreation room, piano, games, and spa open to the starry Colorado skies offer relaxation and celebration. Lunch and dinner, creatively prepared by your hosts, are served family-style around a large oak table. Breakfasts are self-serve from a bountiful kitchen. The kitchen is also available to guests for their weekend meal preparation of their own menus (at our expense). Some prefer to venture out to one of the excellent area restaurants (at your own expense). All linens, towels, bathrobes and bathroom soap are provided. Courtesy laundry facilities are also available in the lodge. Prepare to be pampered as a special part of God’s family during your visit. Our hosts are dedicated to ensure that your stay is memorable down to the chocolate dipped strawberries and fresh baked cookies. Marble is located about four hours southwest of Denver International Airport. From the Denver area, drive Interstate 70 to Glenwood Springs, Colorado. Travel south from Glenwood Springs on Hwy. 82. About 12 miles from Glenwood turn southwest onto Hwy. 133 at Carbondale. Continue on Hwy. 133 past the town of Redstone. 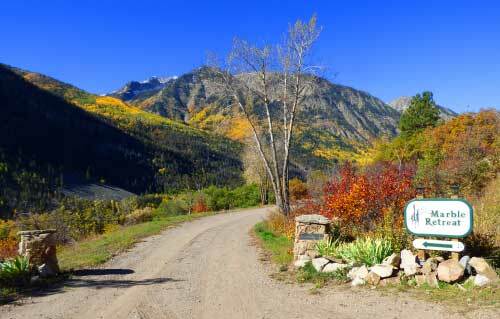 Just before the ascent to McClure Pass, turn left onto County Road 3 toward Marble. Five miles from Hwy. 133 turn left onto Serpentine Trail. Follow this dirt road 1 mile and turn left at Bannockburn and the Marble Retreat sign. The retreat lodge is found in the cul-de-sac at the end of the dirt drive.